13) On July 10th, 2003, the CSAAB chose the WEST configuration as PREFERENTIAL after a long period of CSAAB meetings and research undertaken by AENA. A) What does PREFERENTIAL configuration mean ? B) What was the situation like in the beginning ? C) What was the decision making process ? OACI defines a preferential configuration as one that is maintained until it reaches a tailwind limit of 5 knots with taking off trajectories in the same direction at 15 degrees. The Environmental Impact Declaration (D.I.A.) demands that the towns affected by the PREFERENTIAL CONFIGURATION be soundproofed, thus this decision carries great importance. The D.I.A. also gives the CSAAB legal authority to decide the PREFERENTIAL CONFIGURATION. The Environmental Impact Report, later called the Environmental Impact Declaration, gave AENA and the General Management of Civil Aviation (DGAC - Direcció General d'Aviació Civil) one year from its date of publication to undertake any research needed, before taking actions related to sound emissions, to find out if in the future it would be more favorable to use the WEST configuration, as long as the safety of the people and airplanes is guaranteed, in order to minimize acoustic impact. During CSAAB's sixth meeting held on October 31st, 2002, Vicente Navarro, representative of Gavà City Council, asked about the progress of the research being done on the WEST configuration. Javier Montoro (Pla Barcelona) responded that the study would be completed before the end of the year 2002 and would be presented to the commission within the timeframe set out by the D.I.A. During CSAAB's eighth meeting held on December 19th, 2002, Javier Montoro (Pla Barcelona) showed the results of the study pertaining to the WEST configuration. The mayor of Castelldefels, Antoni Padilla, affirmed that the sound range of this configuration affects populated areas that were not affected by the EAST configuration. On January 23rd, 2003 a technical meeting was held to discuss the research done on the preferential configuration of the airport of El Prat. The meeting was directed towards resolving questions about the interpretation of the document that AENA had presented as well as presenting additional information that the City Council of Castelldefels had requested. Fernando Arenal and Francisco Escriu (AENA) explained the criteria they followed to choose the trajectories of the planes. They clarified that takeoffs in WEST configuration would head towards the NBD in Vilanova flying over agricultural zones and less populated areas in the first part of the ascent, and thus avoiding maneuvers which produce a greater noise level. In response to a question from the City Council of Castelldefels, Francisco Escriu clarified that the expected trajectories would divert a maximum of 8 degrees from the axis of the main runway due to the presence of the Garraf massif. 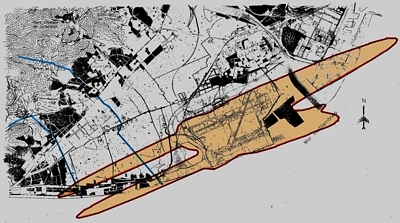 The City Council of Castelldefels asked why the scenario planned for 2004 and takeoffs from the transverse runway weren't included in the study. Javier Montoro (Pla Barcelona) avoided the question by affirming that its effect was already taken into account in the sound range of the scenario for 2015. The City Council of Castelldefels also asked if there was a possibility to establish sound quotas that would distribute noise throughout the territory. Javier Montoro (Pla Barcelona) responded that this procedure was causing a lot of problems in airports where it was applied such as Amsterdam-Schipol. In Amsterdam they were starting to give it up. The technician of Gavà City Council (Ignasi Rucabado) asked about the possibility of increasing the deviation degree from the main runway towards the interior. Francisco Escriu (AENA) avoided the question delegating it to Air Space. The City Council of Prat put forward the European Union's guideline to lower the daytime limit from 65dB to 55dB and the nighttime limit from 55dB to 45B. Javier Montoro responded that these new limits appeared in the guideline as graphic limits and not sound limits. Francisco González (Pla Barcelona) reiterated that the D.I.A. established the limits of 65dB and 55dB, therefore, that was the valid reference. He also affirmed that when new limits were to be established in the future, then the analysis of adapting to these new limits would be taken into consideration. The City Council of Castelldefels asked to add a maximum noise level Leq(max) to the study. Javier Montoro affirmed that the study of maximum noise levels only makes sense when applied to noise reduction procedures to be carried out in the second phase (later on) as outlined in the D.I.A. The City Council of Castelldefels asked for more time to integrate all the information received from AENA. It was agreed to allow one month and a half's time to approve the preferential configuration.